Driving alongside the Lake Chinghai, we came across a small village. Since our trip was not based on detailed schedule, and our driver needed some rest, we decided to stop by and explore. After passing through a short main street franked by motorcycle repair shops, household good shops and restaurants, we found a huge field surrounded by brick walls. 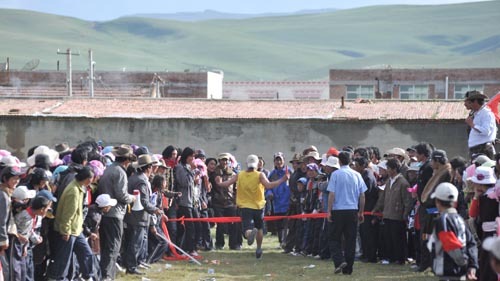 Near the gate of the filed, motorbikes were placed chaotically and many Tibetans were heading toward what seemed to be a main entrance to the field. We parked our van near the gate and headed to the field also. Sandy dust were floating in the air from deteriorating pavements, but the air quality at the village surrounded by rush, endless grassland was refreshing. We were already at an altitude around 3000 meters. Dry air and cool temperature similar to autumn’s end in Japan felt really good. However, there was a huge difference between humid and pollution loaded heavy air of Beijing and here: intensity of the sunlight was merciless. We were indeed standing at the Tibetan Plateau. 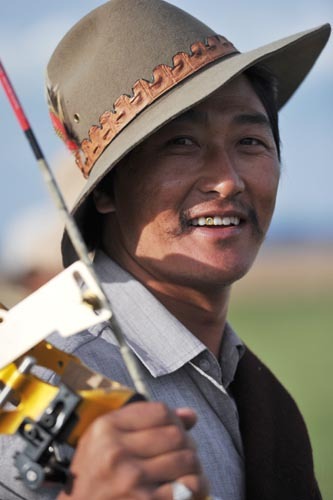 Men and women, young and old, faces of Tibetan were radiating in copper tan. Although the gate to the field was pad-locked, people never seemed to pay attention to that. They just pry open the gate a bit and slipped themselves into property. Of course, we followed suits. Then we realized that it was a school we were entering, and we happened to hit the school sports festival. Kids were in the middle of running events and there were lots of joyous cheers. It was indeed quite rare for running into a school sports festival in totally unfamiliar place. I had no choice but to grab my gear and jump into where the actions were. As a self-proclaimed Olympic photographer, it was almost automatic. With big cameras and lenses, I positioned myself by the track course. People around me were looking at me with full of curiosities but their eyes were not hostile or refusals at all. Wherever I point my camera, kids would move toward that direction and kept telling me to take their photos. Then after I made the shot, they would run up to me and enjoy themselves while looking at their images shown on the LCD monitor of my camera. 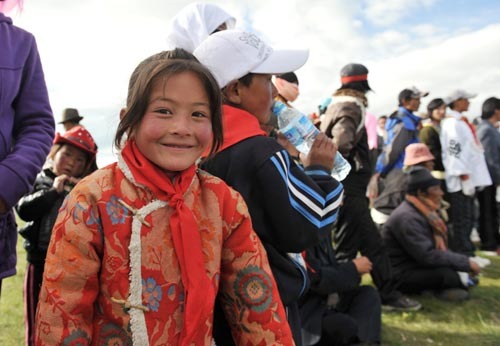 Unlike Muslims, Tibetans seemed to be more tolerant toward being photographed. An old Tibetan family, presumably a husband and wife even came up to me and gestured me to take their photos with grandkids. They did not ask me to send the photograph back to them or anything. They were just happy being photographed by this foreign photographer (or by the big camera they had never seen before). 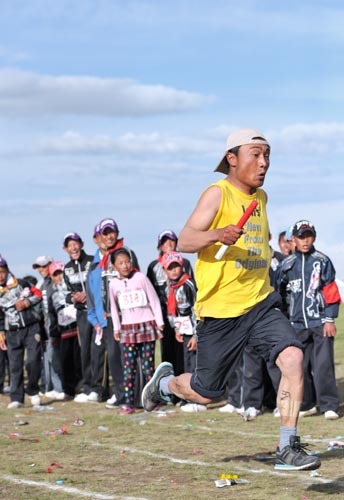 Incidentally, those Tibetan kids could run really well, despite the fact that they were running full steam at this high altitude with thin oxygen level. I felt out of breath and dizzy from just walking at slow jogging pace for about a 100 meters on the flat land from our van to the track course. 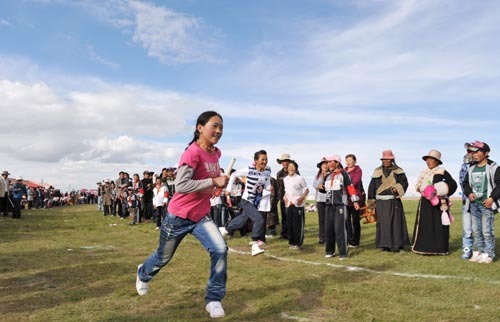 I would not be surprised to see if the Tibetan youth could excel in sports, however they were not allowed to earn international fame by the Chinese government, according to my friend’s explanation. 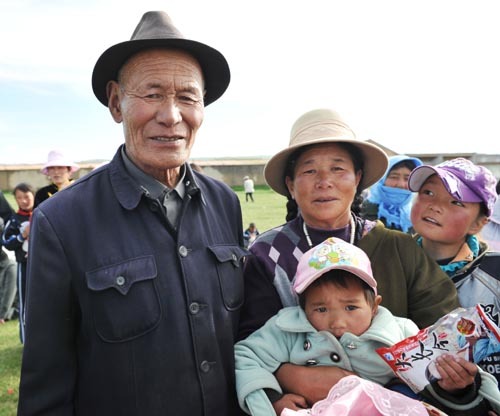 It was an example of complications dealing with minorities that China must face. While kids were having fun with running events, I noticed that there was an archery event by adult men going on at the other side of the field. They were in serious competitions indeed however, I noticed strong liquor smell among those men. 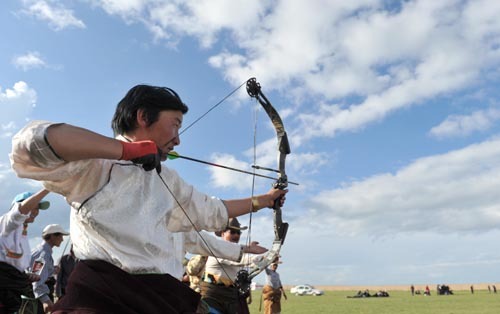 They were split in two teams for shooting each other’s target built upon the ground with their arrows. 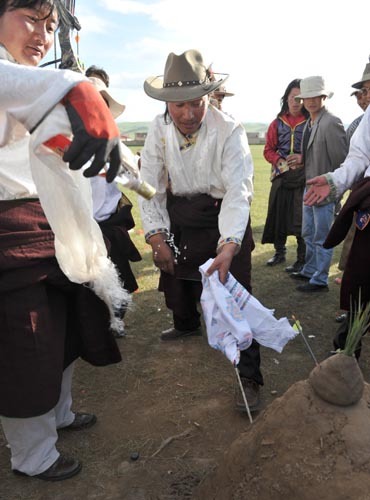 The unique thing was that, before and after the archer shooting his arrow, people surrounding the archer were sprinkling Tibetan hard liquor (80 to 100 proof) on the archer and everyone around while drinking from the bottle in between. I was no exception and got baptized with that stuff. 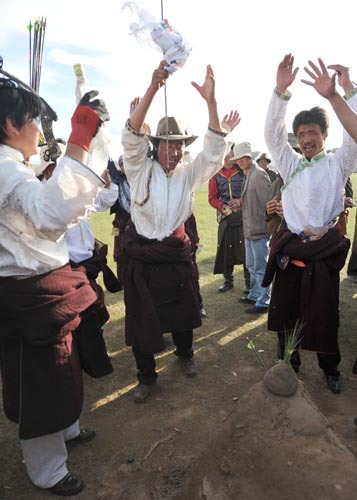 I pride myself of my brought up as I were weaned by Russian vodka and can enter drinking battle with any Chinese with Bai-jyu (fire liquor of China), it did felt pretty heavy stuff, perhaps because of high altitude. 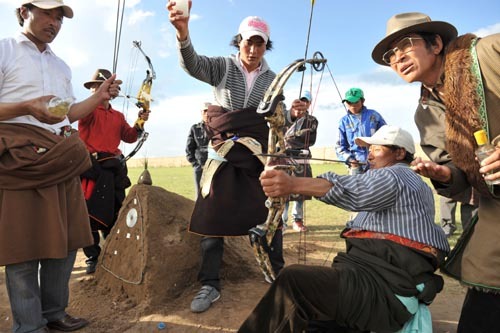 These men drunk from the bottle at any occasions; ceremoniously pulling out the arrow from the target, opposing team missing the target, and of course when their own team hit the target. For them, the reasons were never important. However, one should be aware of the trajectory of those arrows shot after so much liquor. Perhaps we were there for about 2 to 3 hours, but the whole sports festival ended suddenly. Kids who were in running competitions started picking up rubbish from the ground with teachers’ instructions. The field strewn with empty bags of snacks got cleaned up in no time. They did make a mess, but they sure knew how to clean up after themselves. I was impressed. 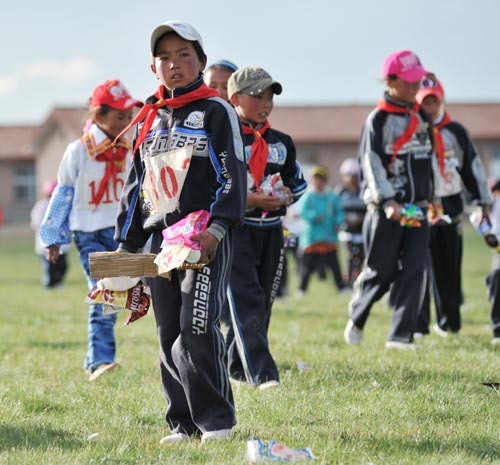 Photographing a Tibetan school sports festival was something I would encounter perhaps once in a life time thing. 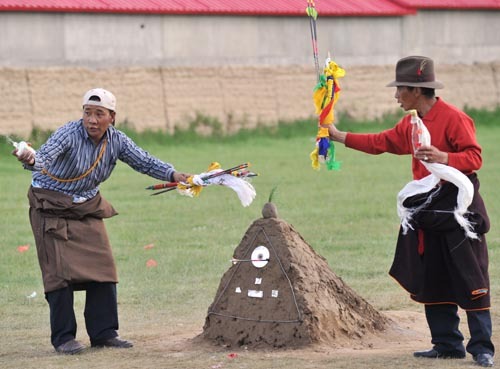 I suppose that the drunken archery event would never make it to the Olympic Games, but I sure hope that this laid-back sports tradition are inherited to the generations of Tibetans to come. I think this guy is a teacher. Kind of nice to cross the finish line like this with lots of cheers. Maybe they are not that old... Ooops. This kid has the potential. A~~~~nd, let's drink to that! Please god, make him miss this shot! If you hit the target, you can take another swig! He reminded me of an actor Robert Mitchum in his youth. Many of you don't know him, right? This guy has a nice charm on one of his tooth. Time for cleaning up the mess and go home, kids!